Just a reminder that Sunday brings the monthly meeting of the Community Advisory Committee for city-sanctioned Camp Second Chance, a place of interest to both sides of the county/city line. If you have a question/concern, this is the place to bring it. The committee meeting is open to all, 2 pm in the community room at Arrowhead Gardens (9200 2nd SW), a few blocks north of the encampment. The next meeting of the Camp Second Chance Community Advisory Committee will be Sunday, October 7 at 2:00 pm. Arrowhead Gardens Community Room, 9200 2nd Ave SW.
That photo from Monday afternoon shows just a few of the many vehicles marshaled for the major cleanup under way in the east-side woods along Myers Way. 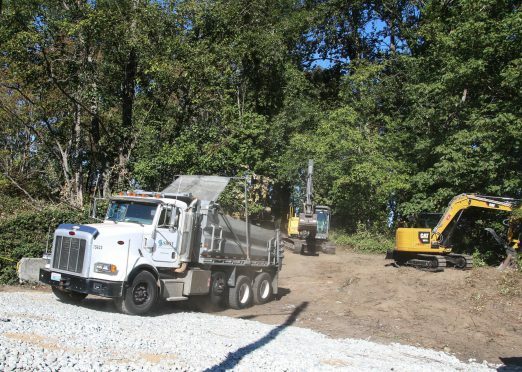 As we’ve been reporting on partner site West Seattle Blog, Southwest Precinct police have been saying for two weeks that this was finally happening, and on Monday, the city announced it was under way. They explain here what they’re doing and what’s planned for the site to keep it from reverting once the cleanup’s over. Meantime, we’re told the most-extensive work is likely to take all week. 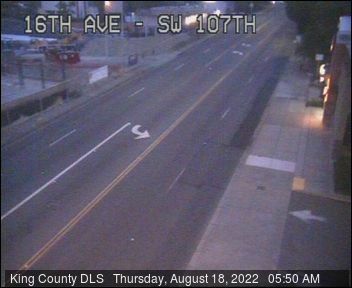 Seattle Mayor Jenny Durkan is scheduled to speak at Wednesday night’s meeting of the Highland Park Action Committee, which along with other groups including the North Highline Unincorporated Area Council has long been agitating for the city (and state, since WSDOT owns the right-of-way along Highway 509) to do something here. 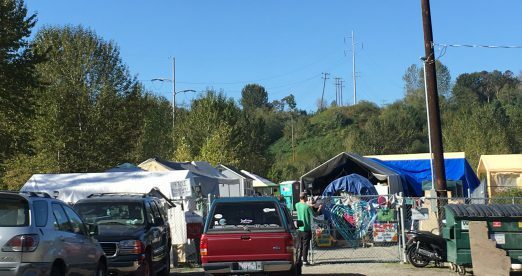 If you have concerns/questions about Camp Second Chance, the City of Seattle-sanctioned encampment that’s close to the North Highline border on Myers Way, or just want to hear the latest on its operations, its Community Advisory Committee meets today (Sunday, August 5th). The 2 pm meeting at Arrowhead Gardens (9200 2nd SW) is the C2C CAC’s first meeting in two months. It also comes less than a week after the city posted an update on the overall sanctioned-encampment program, including a brief overview of C2C. DEADLINE FOR RENEWAL COMMENTS: April 5th – this Thursday – is the city’s deadline for comments on whether the encampment’s permit should be renewed for another year. We covered the recent community meeting on the proposed renewal here; you can comment by e-mailing homelessness@seattle.gov (with Myers Way in the subject line) and/or calling 206-727-8496. COMMUNITY ADVISORY COMMITTEE: The first Sunday of the month would normally be the meeting date for Camp Second Chance’s city-mandated Community Advisory Committee, but because of the holidays, the meeting will instead be next Sunday, April 8th – usual time and place, 2 pm at Arrowhead Gardens (9200 2nd SW). Our coverage of last month’s committee meeting is here. Just announced at the monthly Camp Second Chance Community Advisory Committee meeting: The City of Seattle is reviewing whether to renew the permit for the sanctioned encampment to remain at its site on the city-owned Myers Way Parcels for a second year, and as part of the renewal process, a community meeting is now set for 6:30 pm Tuesday, March 20th, at the Joint Training Facility (which is near the camp, 9401 Myers Way S.) If you can’t make it to the meeting, you can e-mail comments to homelessness@seattle.gov (write “Myers Way” in the subject line) and/or call 206-727-8496. The notice says comments will be accepted through April 5th. Though the camp actually has been at the site for a year and a half (initially moving onto the Myers Way Parcels without authorization in summer 2016), its status as a city-sanctioned encampment didn’t officially start until March of last year, so that’s why the renewal discussion is happening now. We haven’t found the meeting announcement online yet but we photographed the flyer’s two pages – see them here and here. Later tonight, we’ll publish our report on the rest of the meeting; the encampment also was discussed at this past Thursday’s North Highline Unincorporated Area Council meeting, and our report on that will be up soon too. November 6th, 2017 Tracy Posted in Myers Way, White Center news Comments Off on Camp Second Chance: Will it get a second year? This past Sunday, the afternoon snow didn’t get in the way of the Community Advisory Committee meeting for Camp Second Chance, the Seattle-sanctioned encampment on Myers Way. The wide-ranging discussion included updates on the camp’s status, two months after it changed operators – including a drop in its population – as well as much talk about whether it would be renewed for a second year. You can read the full story on our partner site West Seattle Blog. For the first time since the Low-Income Housing Institute (LIHI) has taken over as the operator of Seattle-sanctioned Camp Second Chance on Myers Way, the camp’s Community Advisory Committee will meet this Sunday. The public is welcome at the meeting, 2 pm at Arrowhead Gardens; we confirmed the time/date today with LIHI rep Josh Castle. Conditions on Myers Way outside the camp also tend to come up at the committee meetings, and Seattle Police have swept both sides of the street recently – on the west side, to create a walkway to and from transit facilities at AG, on the east side, to enforce parking regulations, according to what SPD Southwest Precinct Operations Lt. Ron Smith told the Highland Park Action Committee this past Wednesday night. -This month’s Community Advisory Committee meeting, postponed from its early-August date, has now been rescheduled for this Sunday, August 27th, 2 pm at Arrowhead Gardens. -We’ve published another update on the camp’s status, after covering a meeting Wednesday afternoon at CSC with city reps, campers, and leaders of the camp’s likely new operator, LIHI. Here’s the full story. 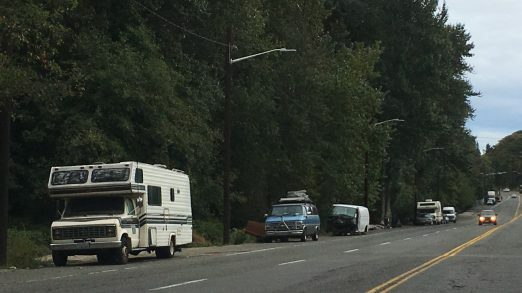 For those tracking homelessness-related issues on Myers Way: On our partner site West Seattle Blog, we’re reporting on management changes at city-sanctioned Camp Second Chance. Its official fiscal sponsor and managing organization, Patacara Community Services, is withdrawing, and the city is talking with the Low-Income Housing Institute – which has a role in all five of the other Seattle-sanctioned encampments – about taking over. Meantime, its resident manager and co-founder Eric Davis says he was evicted and fired – he says it happened after camp leaders asked questions about the status of private funding to build more “tiny houses” at CSC; Patacara says it was “because he was failing to uphold the camp’s code of conduct.” Read the full story here. Due to unforeseen circumstances, the public Advisory Committee meeting that was scheduled for this Sunday, August 6, 2:00 – 4:00 pm, has been postponed. We will send an update with the new date/time/location as soon as possible. The meetings have been happening on first Sundays, with Arrowhead Gardens‘ community room as the most-recent location. We’ll publish an update when we get word of the new plan for the next meeting.